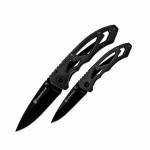 Includes the CK400 and larger CK400L Drop Point Knives. Smith & Wesson Frame Lock Drop Point Folding Knife. 7cr17MoV High Carbon Stainless Steel Drop Point Blade. CK400 Blade Length: 2.2" Handle Length: 3.18" Overall Length: 5.37" Ambidextrous Thumb Knobs Grey Stainless Steel Skeleton Handle with Spine Jimping Pocket Clip CK400L Blade Length: 3" Handle Length: 4.37" Overall Length: 7.29" Ambidextrous Thumb Knobs Grey Stainless Steel Skeleton Handle wit..
Three knives in one package 3Cr13MoV steel blades 3.25" blade length Wood handles w/thin steel inserts etched with three different wildlife scenes - Whitetail deer scene Turkey scene & a Waterfowl scene Bead blast coating Thumbstud Pocket clip Liner lock ..
Old Timer Hunting / Cleaning Knife Kit. 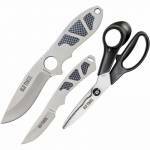 Three piece set includes: 8-1/4" overall fixed knife with 3-3/4" drop point blade, 6-1/4" overall fixed knife with 2-1/4" blade, 7-1/4" overall take apart shears with 2-1/2" partially serrated blades and black plastic handles. Both knives feature one piece construction with faux carbon fiber synthetic handle inlays. Black nylon belt sheath holds all three. 3Cr13 Stainless Blades Standard Edge Satin Finish Stainless Handle Lanyard Hole Thumb.. 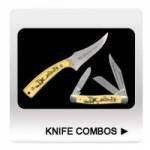 Throwing Knife Set includes 6 knives optimized for throwing and an 8" wood target. 7.5" throwing knives (3 Red, 3 Blue) 8" Wood Target Sheath holds all 6 knives for storage. .. 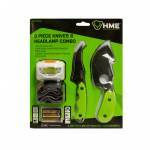 This combo includes a 3w Headlamp with batteries, 4" Guthook, 3.25" Skinner ..